April 25th is ANZAC Day, a memorial day observed by both Australia and New Zealand. Today is the 2nd time in 10 years I have not attended the Dawn Service in Beijing. One year I was in Australia; this year I just decided not to go. This post is my way of marking the day instead. For my non-antipodean friends, ANZAC stands for Australian and New Zealand Army Corps, the soldiers from our two nations who fought in the first World War. ANZAC Day is a public holiday on which we remember those who have fought, and especially those who have died, in all wars. Unlike many memorial days, it does not commemorate a victory or peace treaty. ANZAC Day is the anniversary of the start of a very bloody battle. On ANZAC Day we remember that while it is sometimes necessary to fight, in war, everyone loses. At dawn on April 25th, 1915, Allied troops landed at a beach (now known as Anzac Cove) on the Gallipoli peninsula in Turkey. The campaign became a stalemate with heavy casualties on both sides, and was abandoned after 8 months. By that time, nearly 110,000 soldiers were dead and over 200,000 injured; half were Allied troops (from the UK, France, Australia, New Zealand, and India) and just over half Turkish. But ANZAC Day isn’t just about Gallipoli; it is a symbol of all wars. The 8,709 Australians who died at Gallipoli represent 15% of Australians who died in WWI, and 9% of all Australians to ever die in war. Back in Beijing, in 2004 a friend said she’d heard about a Dawn Service taking place at the Australian Embassy and asked if I’d like to come along. We weren’t really sure where we were going but we made there in time, and joined a group of 60 or so people. 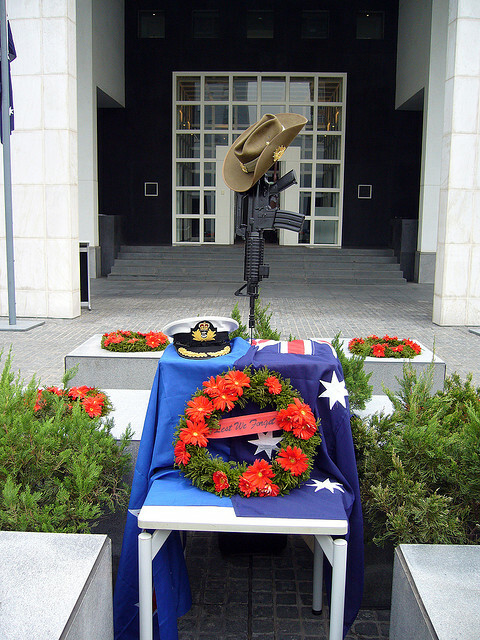 I’ve now been to 8 dawn services in Beijing, 5 at the Aussie embassy and 3 at the NZ embassy. (The Australian and New Zealand embassies take turns hosting.) It was my first time at the Australian embassy and I was struck by how much it reminded me of Canberra – the architecture is reminiscent of both New Parliament House and the War Memorial. The gathering has grown steadily over the years. There were over 300 people at the last few I went to. After the service the host embassy prepares a breakfast buffet for everyone – it’s a “gunfire breakfast”, another ANZAC tradition, meaning that a generous dash of rum (Bundaberg rum from Australia, in fact!) is added to each cup of coffee. It’s also not unusual to see a few people (especially uniformed people) playing a game of two-up. The service finishes at 6am so even with a lesiurely breakfast there’s time to get to work afterward. One year I went to the service in Beijing then took the bus back to work in Langfang afterward. The service itself is a solemn gathering. The gates close at around 5am ahead of a 5:15 start. The sky is starting to lighten but the sun hasn’t risen, so the air is cold. The only noise is the shuffling of feet and some quiet whispers. Red poppies and small pins are given out with orders of service upon entry (I still have most of them saved). The service starts with the entrance of the catafalque party; usually there is at least one Australian and one New Zealand soldier in the party, and often the other two are from two other countries – like the UK, France, India, Canada, or the US. The ambassadors of both Australia and New Zealand address the group, and representatives from many nations lay wreaths (last time I believe there were more than 20 wreaths, from 14 different countries). Many countries send both a diplomatic and a military representative to lay their wreath. 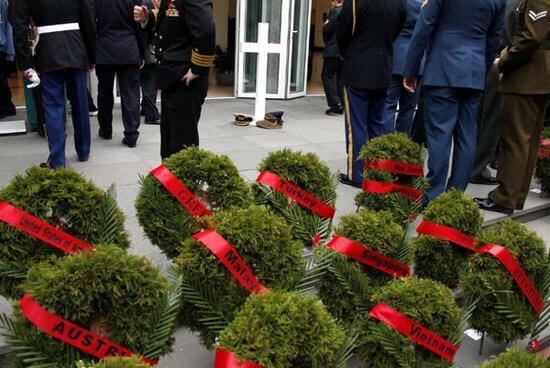 Wreaths at the ANZAC Day dawn service in 2011, at the NZ embassy (from Xinhua). A single bugler plays the Last Post, while the flags of Australia and New Zealand are lowered, beginning a minute of silence. The silence ends when the bugler plays Reveille, as the flags are raised again. Most years the bugler has been a Chinese musician from the PLA (the People’s Liberation Army). I appreciate this – that a Chinese soldier is also taking part in the ceremony. For several years in a row the same bugler played and I could hear him get better from year to year. Another year an American soldier played. Usually this is read by the Turkish Ambassador to China; last year it was read by an embassy staffer who was a direct descendent of a Turkish soldier who died at Gallipoli. This is why I go to the dawn service. While it is a holiday for Australia and New Zealand, and of particular significance for us, there is no “us vs them” mentality. All deaths in war are tragic losses. ANZAC Day does not glorify war. Instead, it calls us to remember the cost of war, on all sides. That is superbly written – we both thoroughly enjoyed it! I hope you don’t mind but I have forwarded it to one of our ministers who is a Navy Chaplain as well as our minister.